Superman's alter ego is Clark Kent. Unlike many other superheroes, Superman dresses up as a human to fit in. What makes the world so oblivious to Clark Kent's secret; Superman? (In regards his poor disguise). Superman has always been a public figure, but he doesn't wear a mask. His entire face is visible to all, and he willingly has photos taken, kisses babies, etc. Batman, Flash, Green Lantern (the Hal Jordan version at least), etc. ALL wear masks to cover their faces. Their masks make people wonder what is beneath them. 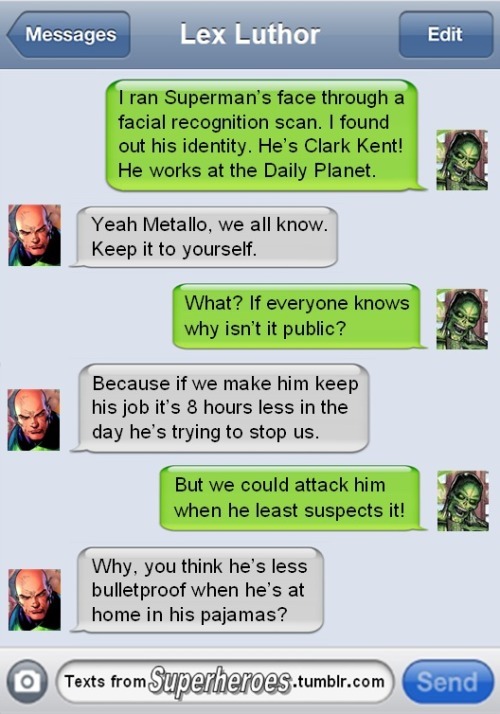 Similarly, since Superman doesn't wear a mask, many (if not most) people assume he has no secret identity. This is aided by the fact that he's always been very open about his back story - he's NOT human, just human-looking. He's openly admitted that he is the last survivor of an alien race, and that he's adopted Earth as his home. It is difficult for people to believe that someone with so much raw power, who has been so open, has a secret. They may wonder what Superman is doing at the moment, but they never wonder who he is. For those who DO suspect he has a secret identity, Clark Kent is not a likely suspect. The only similarities are his hair style and color (though he does subtly change his hair style as CK, when not wearing a hat), basic build, and eye color. Glasses do quite a bit to change the shape of your face, especially when you never publicly remove them. Then we have the steps Superman takes to make his disguise more effective. Clark Kent almost always wears a suit and tie. He wears a button-down shirt, suit coat, tie, nice pants, and simple shoes. He prefers dark browns or blues, and rarely removes any of his clothing layers (excepting overcoats when appropriate) except around family and close friends. Superman wears a very bold costume, skin tight, with a big, billowing cape. His musculature is evident. This disparity does quite a bit to make Clark Kent's body type look different from Superman's. Superman is also an accomplished actor, in a limited scope. In essence, he's spent years creating a single persona - Clark Kent - and he can drop into it in a heartbeat. Everything about Clark Kent is different from Superman. Clark has an entirely different posture, different speech patterns, and different word choice. Clark is passive, except when he is actively working on a story, Superman is... not brash, but firm. From a personality perspective, physical perspective, and presumption perspective, Clark Kent is decidedly NOT a candidate for Superman's secret identity, to 99.99999% of the world. For everything else, there's Super-Hypnotism. I have always assumed - and therefore I have no references to back this up - that the "disguise" relied on the fact that Kent was not Superman. At this point you might well ask, "Huh?" Superman is SUPERMAN! He's super! He flies, he never hangs around for long, he has peircing blue eyes and charisma pours off him like water off the Niagra falls. His very presence strikes awe into those that behold him. Clarke Kent possesses none of these attributes, not one. If one were able to behold Superman and not be flummoxed and completely awe struck, and were therefore able to really take in what he looked like, you might remarke that he did pose a passing resemblence to a certian mild mannered reporter. However, you still wouldn't put two and two together, because Kent simply cannot be Superman, because he isn't dazzling, fast, strong, charismatic etc . . .
One of the most interesting things about Superman for me is that he does think of Clark Kent as his true identity. Remember, even though he is an alien from Krypton, he was brought up by the Kents from a baby. His whole identity and value system is bound up with that. Compare that with Batman. Even though Batman is a costume that Bruce Wayne puts on - it's not innate to him in the way that Superman is to Clark - Wayne thinks of Batman as his true identity. It's an interesting inversion. It can actually be argued that Superman has 3 identities, not 2. While they are all tied together, each is unique and very few people know all three. Superman- Champion of truth, justice, and freedom. Often considered the world's greatest (or even the DC Universe's greatest) hero, he is noble, forthright, unwaivering in his beliefs, and the pinnacle of moral fortitude. He wears no mask, and his eyes are an inhumanly bright clear blue. His physical appearance is that of a human man who is in perfect physical condition. Tall (roughly 6'3") and muscular, with dark brown or black hair that is slicked back with his iconic "spit curl" slightly off center of his forehead. He wears a bright blue costume with bright red cape and "S" shield in gold and red on his chest. Clark Kent, Reporter- Mild mannered, often bumbling or clumsy, intelligent and well read, but somewhat naive and nervouse in social situations. He is a respected journalist, having won a Pulitzer Prize, and often competing with Lois Lane for headline stories at the Daily Planet. He stands slouched forward with his shoulders dropped to give the impression he is shorter than Superman, as well as the illusion he is out of shape with a slight ponch. He wears glasses that distort and mute his eye color, and speaks in a softer slightly higher pitch than in his Superman guise. His hair is usually either slicked back or combed and parted to the side. He has been depicted as either dressing slobishly and disheveled, or in off the rack generic business atire that is slightly too big for him to add to his altered physical look. Clark often exhibits ideals of a typical Mid-Western rural American which contrast to those of the average citizen of Metropolis. Clark, Son of Jonathen and Martha- This is the "real" personae that very few people know. This is who he is when he is alone in his Fortress of Solitude, or at home in either Metropolis with Lois, or on the Kent farm with his parents. Outside of them, only his cousin Kara, his childhood girlfriend Lana Lang, his best friend Pete Ross and probably Bruce Wayne know this version of Clark. He is his most "human" here, his most vulnerable and open self. He is assertive and confident but not as much as he displays in his Superman guise. In more recent continuity many of these aspects have been integrated into his Clark Kent reporter identity, showing him as more confident and outgoing than his traditional Milquetoast personality. He often does not wear his glasses, and stands his full height, but dresses in casual clothing, often shown as wearing jeans and a plaid button down shirt while on the farm in Smallville. It is the separation of these personality traits, as well as using the physical changes of slouching, altering his voice slightly,wearing glasses to distort his eyes and several acting tricks (pretending to burn his tongue on hot coffee or acting startled at a loud noise) that help to differentiate to the public between Clark Kent who is human with flaws and faults from Superman a Kryptonian with powers and abilities beyond any mere mortal. The fact that the personalities are so different prevents people from associating one with the other. If you ask me, I find it intriguing and fascinating. I'm not a big fun of comics but Superman is hard to miss, so here is my perspective. Taking aside the fact that it is unrealistic (it is as much unrealistic or improbable as a man flying), try to see beyond this impossibility and interpret what the real meaning or message might be. Remember that probably the best way to hide is a plain sight, what's right there before your eyes, in real life, can be the hardest thing to notice. It is very hard to see the heroes that are around you if they are regular people, nobody can imagine that behind the not outstanding Clark Kent, this humble and shy person with a regular job, lies Superman. And this I think is a gem of this comic, it tries to show us that we should do a better job at noticing the day to day heroes, the one that with no credit and without ever being noticed or given any credit, are heros to their families, friends or neighbors, that the one sitting next to you, in the office, might just be a super hero. Superman's "disguise" is demonstrated very well in the 1978 Superman movie starring Christopher Reeve. In this scene, Clark Kent is about to tell Lois Lane that he is Superman. We see him go from mild-mannered, hunched-over Clark Kent to confident, standing-up-straight Superman. The transformation is really well-done. This is also discussed in this article: Superman’s most amazing special effect didn’t require computers or a green screen. So the answer to your question is that Superman disguises himself through a combination of body language and carrying himself differently when he's Clark Kent. If you find this unbelievable, consider this tweet. 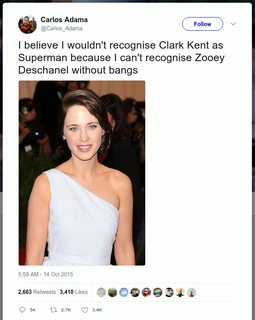 Although it's a joke, it actually did make me realize that the Clark Kent/Superman disguise wasn't that unbelievable after all and shows us this happens in real life too. I thought the answer was simple, because public just see Clark Kent as an ordinary person who resembles Superman. You know, like someone who resembles a celebrity. There is a canon answer from Superman 330 (12-78). 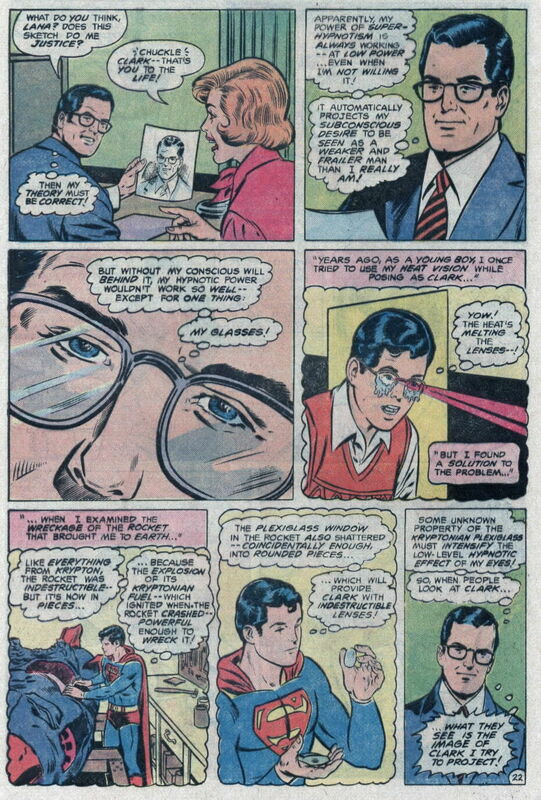 Subconscious use of super-hypnotism, augmented by the Kryptonian lenses of his glasses. Byrne came up with explanations for how Superman’s disguise works, such as the public simply does not realize that he has a secret identity since he is unmasked, that Superman would vibrate his face via his super speed in order to blur his image to photographers, and having Kent keep a weight training set around to explain how the human and presumably weaker Kent could have a frame as massive as Superman’s. Byrne's Superman felt that his deepest roots were on Earth, and that his home planet of "Krypton is anathema to him". 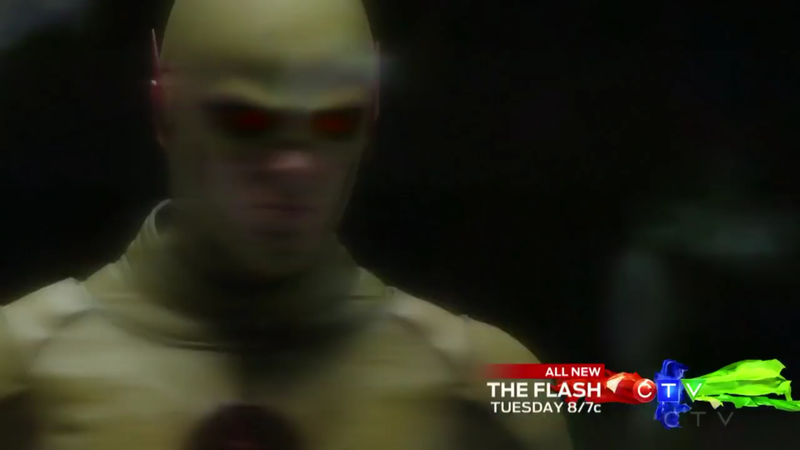 Essentially, what the Flash and Reverse Flash do to prevent pictures from coming out and people from recognizing them. This is for aritistic reasons, i guess. The reader is supposed to recognize him in his disguise. That is, unlike Batman or Zorro (or 10,000 others) who put on a mask in "hero mode", Superman puts on the mask in "non hero mode". The "mask" is mostly wearing glasses and a suit, but still. Does that make Superman an antihero, psychologically? It is strange in any case. Well, along with Superman's poor costume choice (on the author's part), the author also failed to characterize the civilians. Therefore, unless the person is one of the main characters, nobody's going to call him out on his identity. Superman is this super-powered alien celeb who doesn't wear a mask and lives in the fortress of solitude in north pole. Do you wonder about Johny Depp's secret identity? You probably wonder about his private life but you don't wonder about his life as a white-collar worker. the Clark Kent identity isn't a secret identity(like it is in batman's case) but more like the rags kings would wear when they wanted to walk among the ordinary. Clark Kent is a shy klutzy reporter who just happens to look like superman. the resemblance is almost never mentioned. Afaik it was only mentioned in the 50's tv show, superman returns and superman: american alien. Not the answer you're looking for? Browse other questions tagged comics superman dc . How does Superman conceal his identity with just a pair of glasses? why nobody figures out that Superman and Clark Kent are the same person? Why doesn’t anyone figure out He-Man's secret identity? Does Lois Lane Know Who Superman Is (In Any Versions or Reboots)? Does Superman's costume in the New 52 have a special function or purpose? What is the origin of the idea that Lex Luthor is Jewish? How does 'Man of Steel' differ from how Superman is portrayed elsewhere? How much of Metropolis is Toronto?